Mutterings from BJ Kerry: Creative Writing books. I don't have any books on creative writing. Basically because I don't have any extra cash for spending on luxuries such as books. Austerity anyone.. . . . . else? There is a vast and excellent data base of free writing advice available online, Chuck Wending with his 25 of anything series, Janice Hardy with her real life diagnostics. I am eternally grateful to these people for keeping me sane. Because for me writing is like therapy and without it I am one grumpy bunny. So every week I attempt the flash fiction challenges set by Wendig. And every week I check out the writing advice from Janice Hardy buttttt what I love on her site is the real life diagnostics. This is where a wannabe writer wants some feedback on a piece. Say its an introduction to a scene or a piece of dialogue - they say what they want to achieve with a piece and Janice points out the bits she would change. And I quickly add here she is ever so gentle with her critiques and at the same time surgically precise. Truly fabulous. Any way what got me on the topice of Creative Writing books is my two best writer friends got me one. A great big red one that looks very scary. It looks very much like a serious-must get your act together-stop messing with your hair-this is important kind of book. And it is all that and more. 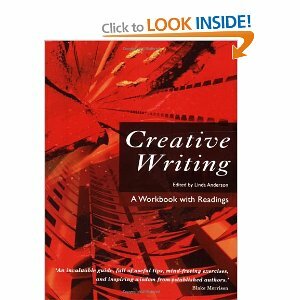 Its Creative Writing edited by Linda Anderson and its used as a text book for the open university course on creative writing. I checked it out on Amazon and it got 7 five star reviews and 2 four star reviews. Out of a total of 10 reviews. Thats pretty good. I am a little intimidated by it. One of the reviews suggested setting a time line and working through it chapter by chapter. On the OU course they do a chapter per week. So I might try something like that. I'll let you know my progress. Some serious work for the summer.